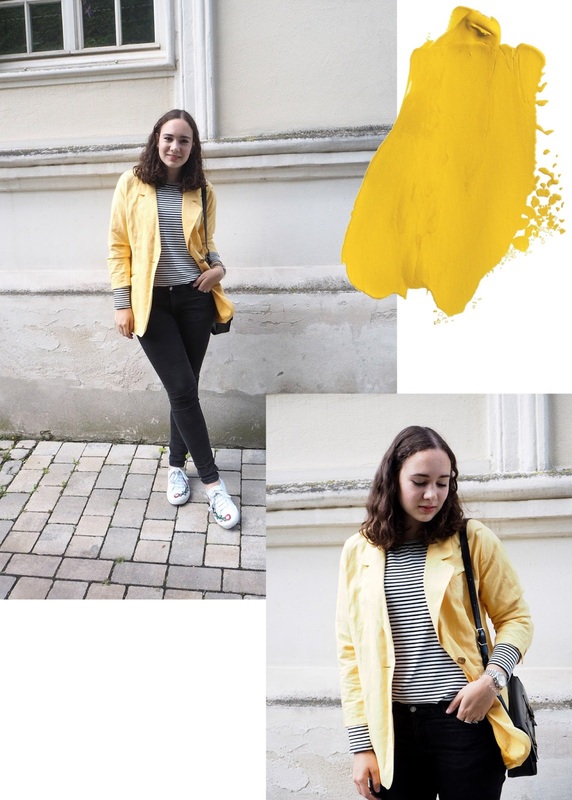 I´ve already warned you, that you are going to see this yellow blazer a lot in the near future - and here I am, with a second outfit starring my sushine blazer. I loved the combination I wore in one of my last outfit posts with straight-legged jeans and a simple white tee for a rather summery outfit. While this combination with the striped longsleeve and black jeans is much more a transitional look, I love it just as much. 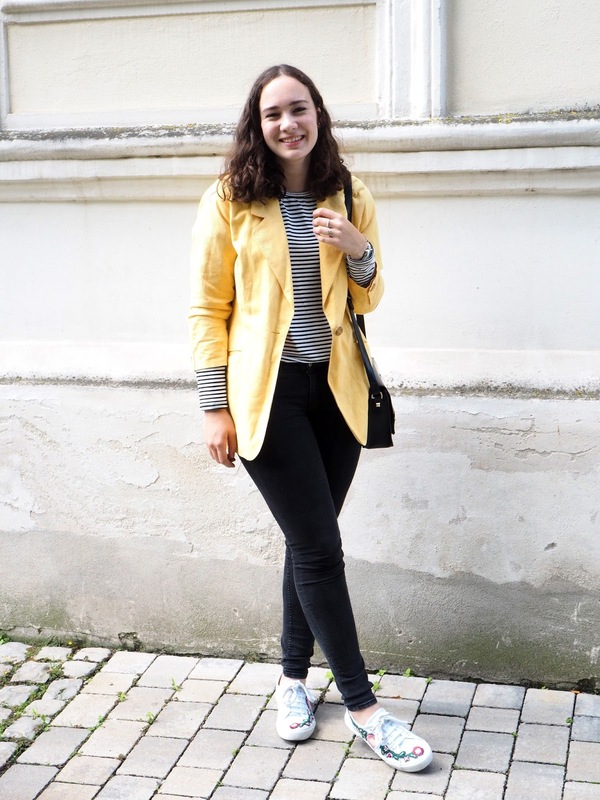 I think you can never go wrong with a monochrome outfit in black, stripes and a colorful jacket. 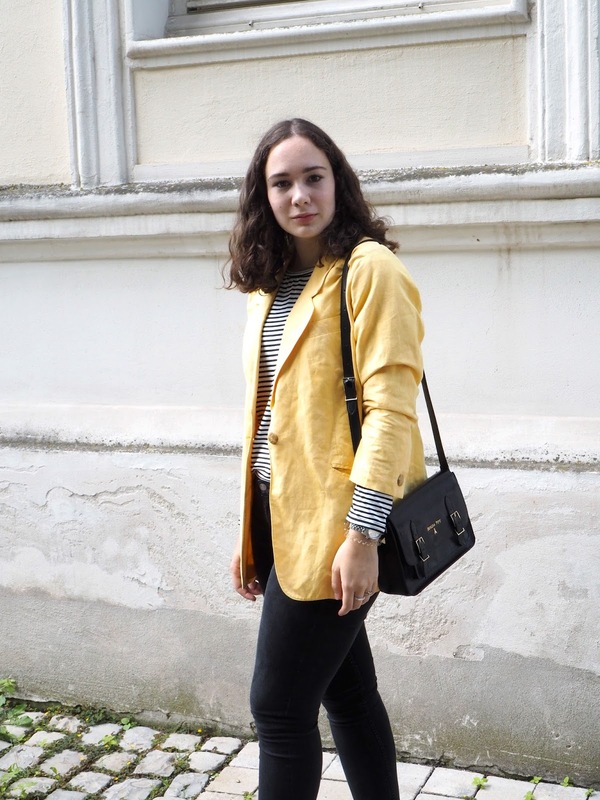 Since I am currently getting used to the color yellow in my closet, I didn´t want to go all out immediately. Therefore, moderation is key. 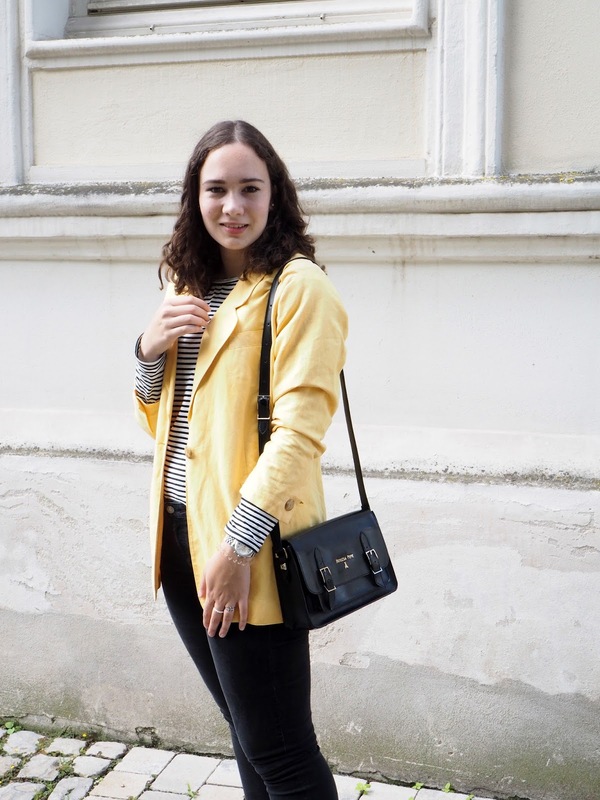 With yellow being such a statement color, it´s best to choose one yellow piece - let that be a handbag, jacket, tshirt. 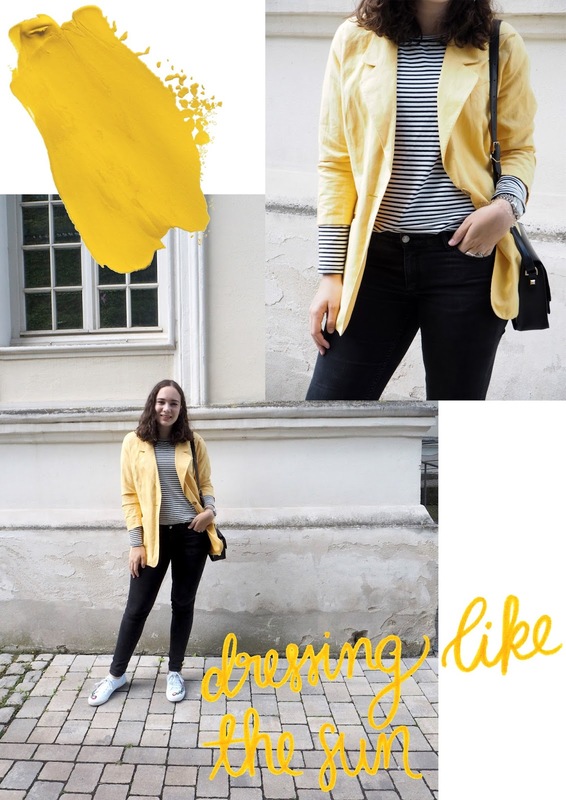 Because dressing like the sun ist all fun and stuff, until you run around in an all yellow outfit - and yellow defenitely isn´t the new black. In order to avoid wearing yellow on yellow on yellow, I like to keep the rest of the outfit neutral. Say you chose a yellow handbag as your piece, go for an outfit in neutral or monochrome shades such as denim, white and black. This is a great tip, not only for dressing like the sun, but getting dressed in general. It is proven that uneven numbers are most appealing to the eye. 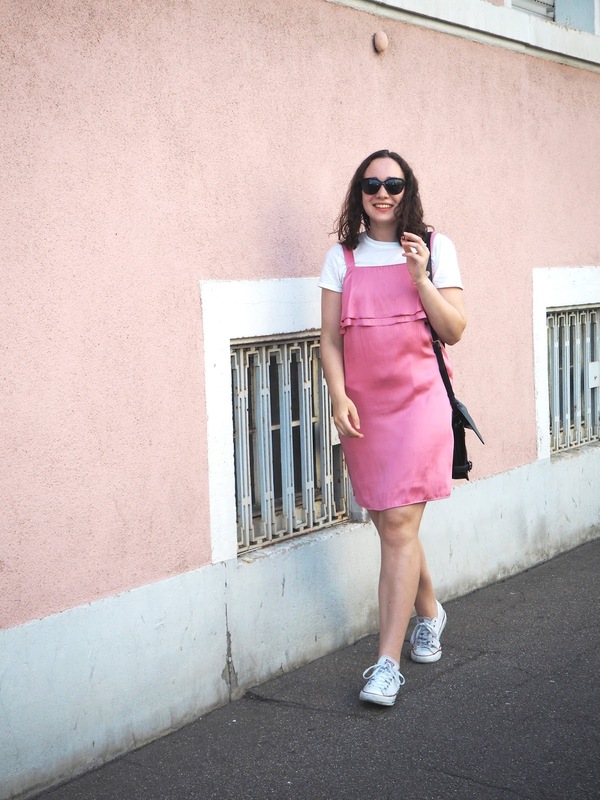 Therefore, dressing in 3 colors is supposed to be a foolproof method of creating an outfit that is visually pleasable to the eye - at least in terms of colors. In this case I chose black, white and yellow - which works really well in my opinion. I think picking one dark, one light and one colorful color always works the best. Ja so geht es mir auch. Mit Orange bin ich zwar noch nicht warm geworden - bisher - aber ja, schöne Sommerfarben sind sie definitiv. I really love that 3 colors are key rule you mentioned. This outfit is so cute and I would totally wear it. I think the black and white contrast make a great base color to go with the yellow jacket. I think the 3 color rule is such a foolproof method when it comes to putting together an outfit. I am glad you like the outfit.